You know one area where I prefer Bing over Google is with the homepages of the respective search engines. 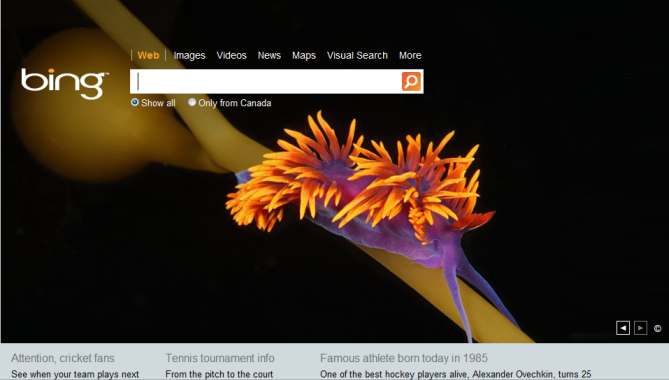 I love the dynamic nature and `picture of the day`on Bing. I like the little information tidbits at the bottom. It`s kind of a fun way to begin your search. Today in our third installment of optimizing for Bing in 2010, we look at the second item from the list above; site architecture. Never mind Bing, but having a logical URL structure and hierarchy to your site is key for any search engine optimization efforts that you may be working on. If your site’s structure and hierarchy is blemished or broken, then it will not achieve the optimal placement within the search results that you desire from the search engines. Below we have compiled ten tips that will help you optimize your site for Bing. While many of these tactics and practices are not unique to Bing, there are a couple that are more specific for Bing. Regardless following these best practices can help you gain a more visible presence in Bing. Use descriptive file and directory names - educate Bing and the other search engines about the topicality of your site through your site hierarchy. Relevant keywords in your naming conventions can provide a big boost. Besides being far more user friendly for end users to remember, the strategic use of keywords in file and directory names will further reinforce their relevance to those pages, to both the user and thus to the bot. Use hyphens (and avoid using underscores) as word separators - This syntax will help msnbot (and soon Bingbot) to properly parse the long name you use in individual words instead of as the folks at Bing state, `"having it treated as the equivalent of a meaningless superlongkeyword." Do not bury your content/limit your directory depth - according to Bing, creating a deep directory structure will likely mean the bot never gets to your deepest content. To alleviate this possibility, make your site’s directory structure shallow, no deeper than four child directories from the root. I would add that the closer you can keep you important to the root, the better. Step 1: Copy and paste the entire URL below as a single URL into the address bar of your browser: http://www.bing.com/webmaster/ping.aspx?sitemap=www.YourWebAddress.com/sitemap.xml Be sure to include the full URL for your website’s sitemap.xml file at the end of this line. Avoid creating pages in forms, Flash or frames - this can help prevent Bing from not seeing all of the content you would like them to. According to Bing, types of pages that can trip up search engine bots include forms (there’s typically no useful content on a form page) and authentication pages (as bots can’t execute authentication schemes, so they are blocked from seeing all of the pages behind the authentication gateway). Pages that require either session IDs or cookies to be accessed are similar to authentication pages in that the bot’s inability to generate session IDs or accept cookies block them from accessing content requiring such tracking measures. Avoid having a high number of broken links on your site - this can have an impact on crawl rates and how effectively Bing is able to crawl and more importantly index your site`s content. Also from a user perspective, ensure that your site features a custom 404 error page to help direct them to the information that they are looking for. Domain age is important to Bing - Bing places some weighting on the age of your domain, so before you proceed with some re-branding, you might want to consider the impact that this has on your search engine placement especially in Bing. Domain age is one way that Bing establishes authority for your site. Monitor you site in Bing Webmaster Center - http://www.bing.com/webmaster. While the information presented in BWC is not as in-depth as the data found in Google Webmaster Tools, you can still review crawl and indexing issues.